Amnesty International has detailed how civilians have been killed in US drone strikes in Pakistan, highlighting the case of a grandmother who was killed as she was picking vegetables. Family members of the 68-year-old woman were injured in a second attack as they were trying to tend her. The report has also detailed the strikes in Yemen, arguing that the US has broken international human rights law in the African country. 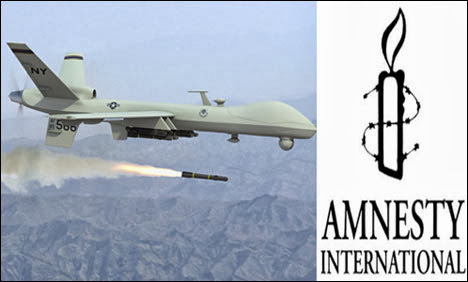 Amnesty only investigated nine of the many US drone attacks which struck Pakistan over the past one and a half years. In one of the cases reviewed by the rights group, 18 laborers in the country’s North Waziristan were killed by a US drone stike as they were waiting to eat dinner. “Amnesty International has serious concerns that this attack violated the prohibition of the arbitrary deprivation of life and may constitute war crimes or extrajudicial executions,” the report said. Last week, the United Nations called on Washington to become transparent about the number of civilians killed by CIA drone attacks. According to UN Special Rapporteur Ben Emmerson, the preliminary information collected for a new report showed over 450 civilians have been killed so far by drone strikes in Pakistan, Afghanistan, and Yemen. Other local and international reports show that the number of civilian victims is much higher, and only 2 percent of those killed in US drone strikes have been militants. Emmerson said that Pakistan’s foreign ministry has records of as many as 330 drone strikes carried out in the country’s north-western tribal areas since 2004. About 2,200 people, including civilians, have been killed in the attacks, according to the Pakistani government.